Forget about constitution " Konstitisyon Se Papye". Forget about the way most people believe it should be. In Haiti, we do things a little bit differently. Let's put it this way, the power is shared between the three branches of government with only one difference, the executive branch takes a bigger part of the cake. 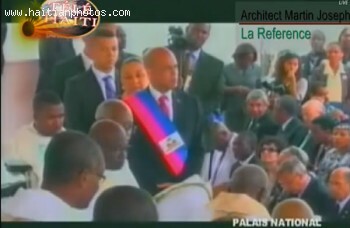 At least this how our president Michel Martelly sees it. In a recent statement that actually did not please too many Haitian authorities, the president would like to make the public believe that the executive is above the other powers. Some of the critics of the presidents did not take time to react to this statement saying that the head of state ignores the principles of the separation of three powers. Is president Michel Martelly right to think that the three powers are not in equal footing in Haiti and that the Executive power which he is in charge of is above the other two? Do you think we should eliminate alltogether the Legislative and the Judicial branches of government and let the executive branch run the entire show? I think it should be this way long time ago. What have we been waiting for?